Microsoft AppLocale is a utility that allows Windows users to display foreign language character sets or codepages in non-Unicode legacy code-page based application program that is different from current system locale. Otherwise, the text in the program’s interface may appear garbled and unreadable. But not only the UI of the application may display garbage characters, even the setup file or installer that runs the installation process can be unreadable when the language locale setting is incompatible. When the setup requires a lot of options to be set or configured, the unreadable text can be a problem and may lead to error. Thus, AppLocale allows users to install a program in simulated localized language environment using “Add or remove programs” option. After selecting language for the installer application in which the setup is wrote, AppLocale will launch “Add or Remove Programs” in Windows XP or “Programs and Features” in Windows Vista, Windows 7, Windows 8, Windows 8.1, Windows 10 or later, both simulated in a corresponding system locale for code-page to/from Unicode conversions. In Windows XP, users can add click on “Add Program” to run the setup installer for new program. However, Windows Vista does not has this option and users are only allowed uninstall or change a program. AppLocale was unable to launch the specified application. The cause for the error is due to new security setting introduced in Windows Vista, where a setup program needs to have elevated administrator rights to write to Program Files folder. AppLocale will run the setup with same level of privileges of the user account used to launch AppLocale. The resolution is either to disable UAC (User Account Control), or run AppLocale as administrator, similar to opening an Admin Command Prompt. However, from the Windows Start menu, users are unable to right click on “Microsoft AppLocale” entry and then select “Run as Administrator”. There is no such option on the contextual menu items. The workaround for the restriction is to navigate to C:\Windows\AppPatch\ folder using Windows Explorer, the right click on AppLoc.exe and select Run as Administrator. To avoid this hassle permanently, you can opt to run AppLoc.exe in elevated mode everytime it’s launched. To set AppLoc.exe to run as administrator permanently, simply right click on AppLoc.exe executable, select Properties. 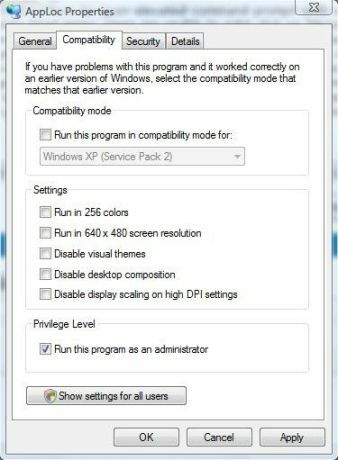 Then click on Compability tab, and finally tick the check box for Run this program as an administrator option under “Privilege Level” section.